It’s not every day a goalkeeper gets on the score-sheet, but that’s exactly what Harrogate Railway stopper Tom Goodwin did in his side’s final pre-season friendly on Saturday afternoon. 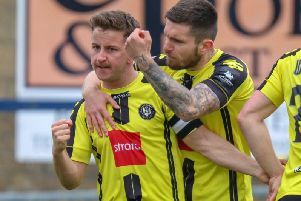 In an otherwise uneventful clash with Field AFC, Goodwin provided a spectacular moment for the home supporters as his goal-kick travelled deep into the opposition’s half and bounced over the head of Field’s stranded goalkeeper. The visiting ‘keeper tried in vain to scramble the ball off the line, but couldn’t prevent the ball crossing the line as a surprised Goodwin was congratulated by his equally shocked team mates. Wigan-based Goodwin has been in good form at the other end too, often keeping Railway in games with important saves, and will no doubt be a key figure in Railway’s season, beginning on Saturday with the visit of Droylsden.